This is a compilation of selected rites and blessings from the liturgical texts of the editiones typicæ issued after the Second Vatican Council in the character of the former Collectio Rituum. Features include a side-by-side Latin-English format, gilded edges, a gold-stamped cover, and excerpts from the Manual of Indulgences. "Being a selection, this short ritual is primarily intended for use in the celebration of the sacraments and the administration of blessings when they take place outside the church building and the full range of liturgical books is not readily accessible. "The Latin-English bilingual format of this book facilitates the whole or partial use of Latin texts when it is pastorally prudent to do so. 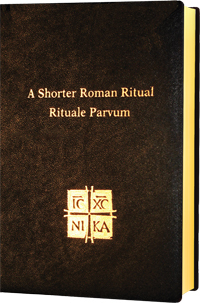 The presence of Latin in an otherwise English-language collection gives appropriate witness to the importance of the Latin language in the Roman Rite and is in harmony with what was stated by the Second Vatican Council: 'The use of the Latin language is to be preserved in the Latin rites' (Sacrosanctum Concilium, 36)." *Note: As the International Commission on English in the Liturgy (ICEL) continues to approve more rites and blessings in the updated English translation, all of the English rites and blessings in this book will eventually become out of date in the next several years. However, all of the Latin rites and blessings, including the prayers from the Manual of Indulgences, have not changed and will continue to be up to date. All sales of this book are final.